Yesterday, enterprising striker Mfon Udoh scored two goals when Akwa United FC won 4-0 against Sunshine Stars FC in the Nigerian GLO Premier League. Udoh has scored 11 goals during the season, making him one of the highest scorers in the Nigerian league. Udoh is currently chasing Bishop Onyeudo of Enyimba FC, Victor Namo of Nasarawa United FC and Dele Olorundare, formerly of Sunshine Stars FC, who have all scored 12 goals. As most followers of Nigerian football have noticed, Olorundare has joined Turkish second level side TKI Tavsanli Linyitspor. While Onyeudo, Namo and Olorundare are all established strikers, Udoh is inexperienced and rather unknown outside the Nigerian borders. Unfortunately, it is difficult to find information about the player. Udoh is from Akwa Ibom, a state in the coastal South-Southern part of the country. Last season, Udoh was a fringe player for Akwa United FC, failing to score during a handful of matches. On 31.03.2013, Udoh scored his first ever goal at top level of Nigerian football. Based on match reports I have read, Udoh is a natural goalscorer. Some of his goals have been tap-in goals from close range. His two last goals, scored yesterday, were both a result of a goalmouth melee after corner-kicks. Other goals have been clinical finishes in the box after errors from defenders. As far as I know, Udoh is a fast player with decent ball control and dribbling ability. Based on pictures I have seen of Udoh, he seems to be of rather average height and rather skinny. Udoh is definitely not a target man, but more of a “fox-in-the-box” striker. Unfortunately, I am not sure how old Udoh is. Several sources describe Udoh as a “youngster” and I think he is still in his teens, or in his early twenties. On 03.08.2013, Udoh won the “League Bloggers Award”, implying that he was the best player in the GLO Premier League for the month of July. What makes Udoh’s 11 goals even more impressive, is the fact that Akwa United FC is a rather modest side with very limited resources. Despite his current success, I think the best thing Udoh can do is to stay in Nigeria for a season or two, showing that he is a consistent goalscorer – just like Dele Olorundare had done when he left for Turkey. 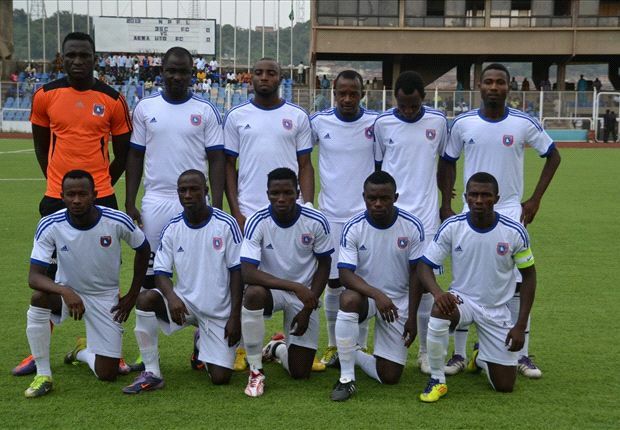 The picture is of Akwa United FC and was found on goal.com.